Venom is a barren, deserted planet in the Lylat System that starred in the Star Fox series, as well as Super Smash Bros. Melee. Much like Corneria, battles take place on the Great Fox, which is flying over the surface. Unlike Corneria, battles take place on the Great Fox's four wings. 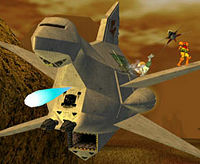 The Star Fox Team sometimes appears in Arwings and open fire on players, and on occasion, Star Wolf does as well. At one point in the stage, the Great Fox goes into a cave. While in the cave, if a player is sent flying diagonally, the player can hit the wall of the cave and survive. Venom reappears in Super Smash Bros. Ultimate, with updated graphics. This page was last edited on March 12, 2019, at 15:27.